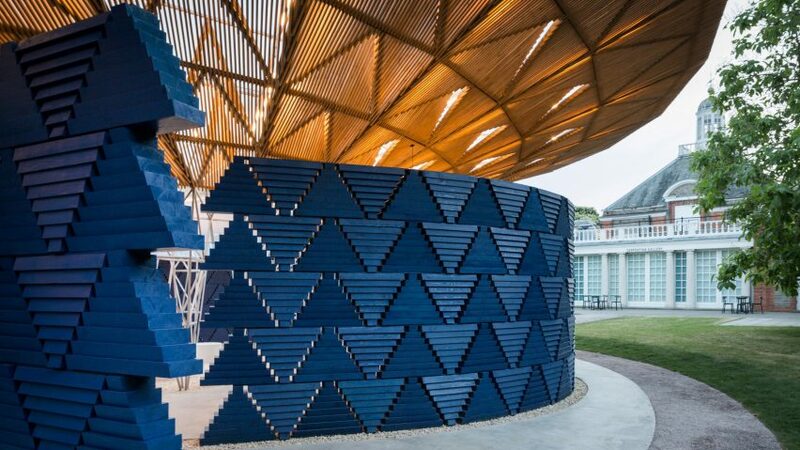 This week on Dezeen, the RIBA named the UK's best new buildings and Diébédo Francis Kéré revealed his Serpentine Pavilion in London. Burkinabe architect Kéré designed a structure with a canopy and a courtyard at its centre for the high-profile commission's 17th pavilion, which Dezeen filmed with a drone when it was unveiled on Tuesday. Meanwhile, Dutch firm OMA revealed its plans for the fourth edition of MPavilion, billed as Australia's answer to the Serpentine Pavilion. The design will feature a reconfigurable amphitheatre topped with a floating roof. The Royal Institute of British Architects named 49 winners of its national awards, ranging from a cluster of luxury townhouses to the new wing for the Tate Modern museum and workshops for the National Arboretum. The 20 residences contending for RIBA's House of the Year Award were also revealed, including Richard Meier's first UK building and a cork-covered holiday home in Essex. Across the pond, student-designed cabins and a house overlooking a lake were among 11 recipients of the American Institute of Architects' Small Project Awards. Also in the States, Diller Scofidio + Renfro's US Olympic Museum broke ground in Colorado Springs and the creators of New York's High Line launched a website offering advice to those working on similar infrastructure regeneration projects. Following the devastating Grenfell Tower fire, victims are to be rehomed in luxury Kensington blocks and cladding is being removed from other residential high-rises across the UK over safety concerns. In other news, David Adjaye, Bjarke Ingels and Sou Fujimoto were among the seven architects shortlisted to design an events pavilion in Edinburgh, Scotland. Popular projects this week included dRMM's Oldham Maggie's Centre, a cabin on a Swedish mountain and a skinny timber house in Japan.